Buzz Lightyear Astro Blasters Attraction in Tomorrowland in Disneyland and in Tokyo Disneyland, taking the place of the CircleVision Theaters. Buzz Lightyear Astro Blasters was based upon its counterpart, Buzz Lightyear’s Space Ranger Spin, in Magic Kingdom Park at Walt Disney World. 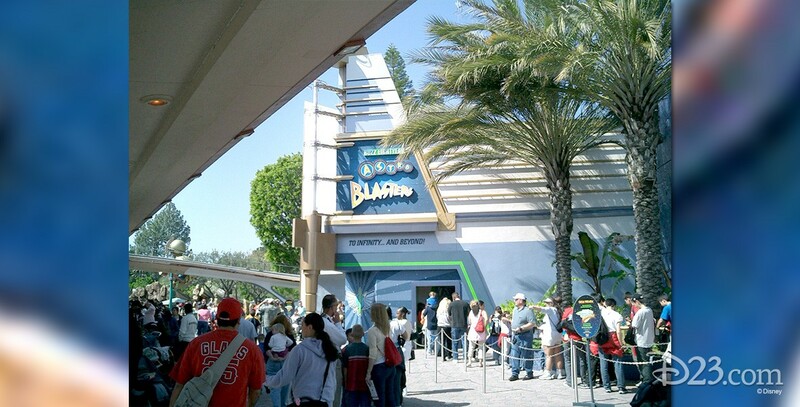 The attraction opened in Tokyo Disneyland (where it is known as Buzz Lightyear’s Astro Blasters) on April 15, 2004, and at Disneyland on May 5, 2005 after soft opening in March. There is also a Buzz Lightyear Astro Blasters Interactive Experience where online guests can team up with Disneyland park guests by lighting up special targets enabling them to obtain higher scores. The Hong Kong Disneyland attraction, which opened September 12, 2005, is called Buzz Lightyear Astro Blasters. A Buzz Lightyear attraction, called Buzz Lightyear Laser Blast, opened on April 8, 2006, at Disneyland Paris. A version called Buzz Lightyear Planet Rescue opened in Tomorrowland at Shanghai Disneyland on June 16, 2016, with a new interactive targeting system and storyline. The attractions are based on the Disney-Pixar film, Toy Story 2.